Duncan Rodger, a Kilmallie player from Inverlochy, Fort William, died on Sunday. Tributes were paid yesterday to a Highland shinty star after he was found dead at the age of 29. He leaves behind partner Emma and a six-year-old son James. Friends and teammates of the goalscorer were left “devastated” by the news. Mark MacPherson, the Kilmallie manager, said: “I played golf with Duncan on Sunday and he was in excellent form. “He was looking forward to playing for us in the MacTavish Cup final on Saturday week. Our parting conversation was about training on Tuesday. “Our club and his former club, Fort William, are totally devastated at this tragedy. Kilmallie have asked for all their matches to be cancelled this weekend in a mark of respect for a player whose attacking flair was widely respected in the game. 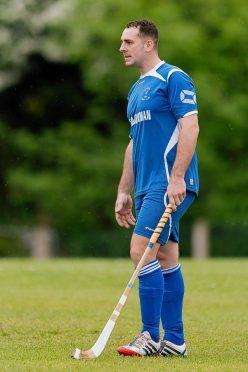 Mr Rodger made his name with Fort William, for whom he appeared in six Camanachd Cup finals, the last being in 2010 when the An Aird club won the trophy for the fourth successive season. After joining Kilmallie three years ago his goalscoring feats spearheaded the Caol club’s revival as they won the National Division title last autumn to take them back to the Premiership for the first time in seven years. He was a salesman for a building services company. On Saturday morning, Mr Rodger had posted on social media saying: “Camanachd Cup day -it doesn’t get any better”. That afternoon, he scored two goals to help Kilmallie beat Lochaber and reach the quarter finals. Jim Barr, president of the Camanachd Association, said:”This is a great shock and a huge loss for the shinty community.